Comprehensive Cancer Centre, in Central Jakarta, Indonesia, is part of First REIT's portfolio. Photo used with permission of OUE Lippo Healthcare. 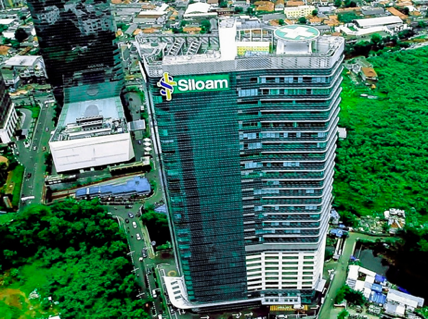 First REIT reported that its net property income for the third quarter rose 5.4 percent on-year to S$28.9 million due to contributions from the acquisitions of Siloam Hospitals Buton & Lippo Plaza Buton and Siloam Hospitals Yogyakarta. The properties were both acquired in the fourth quarter of 2017, Bowsprit Capital, the REIT’s manager, said in a filing to SGX after the market close on Tuesday. Gross revenue for the quarter ended 30 September rose 5.1 percent on-year to S$29.24 million, the filing said. The distribution per unit (DPU) for the quarter was 2.15 Singapore cents, up 0.5 percent from 2.14 Singapore cents in the year-ago quarter, it said. For the nine-month period, net property income rose 5.4 percent on-year to S$85.86 million, while gross revenue increased 5.4 percent on-year to S$86.88 million, it said. The DPU for the nine-month period was 8.62 Singapore cents, up 0.6 percent from 8.57 Singapore cents in the year-ago period, it said. In its outlook, the REIT’s manager said that private healthcare demand would continue to get support from Indonesia’s growing adoption of the national health insurance plan; it cited Healthcare Asia Magazine data projecting Indonesia’s healthcare spending would rise to US$47.1 billion by 2020. “First REIT continues to be well-positioned to benefit from this trend with its right of first refusal to Lippo Karawaci’s healthy pipeline of hospitals in Indonesia,” the REIT manager said. OUE Lippo Healthcare has also proposed acquiring Bowsprit, First REIT’s manager, from Lippo Karawaci, which would give First REIT access to OUE Lippo Healthcare’s portfolio of healthcare and healthcare-related assets in Asia, the filing said. “The proposed acquisition of Bowsprit by OUE Lippo Healthcare Limited will be one of our growth drivers,” Victor Tan, Bowsprit’s CEO, said in a statement. “First REIT will then be able to access a more diversified pool of assets via the right of first refusal agreements granted by both OUE Lippo Healthcare Limited and PT Lippo Karawaci Tbk for their portfolios. This will effectively expand First REIT’s geographical catchment within Asia, allowing the trust to potentially pursue more yield-accretive acquisitions to deliver stable returns to our unitholders,” Tan added. First REIT’s portfolio currency has 20 properties across Indonesia, Singapore and South Korea, it said.